DUG Insight User ManualFrequently Asked QuestionsFrequently Asked Questions VelocityWhat are some good ways to create synthetic velocity models? The following describes the workflow to create a Vo+kz velocity model with varying gradients between horizons for the purpose of time/depth conversion. Create a Volume Maths process and type a Name for the process. Click OK. In the Details Panel, at Formula, type the formula 1500 to create a velocity model at a constant value of 1500. 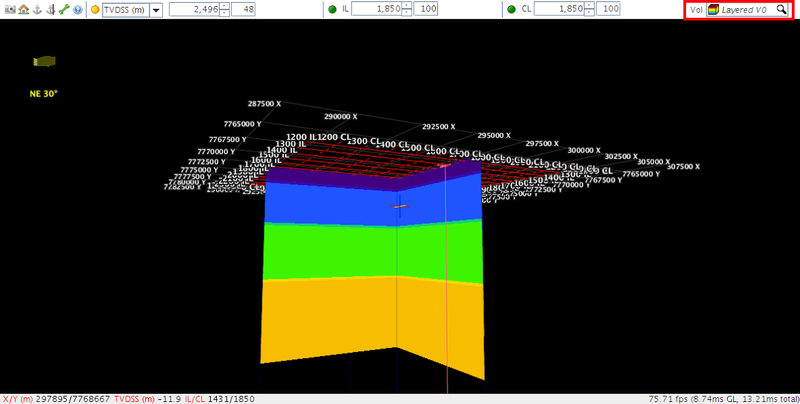 Under the Output Extents section, select a 3D survey. Enter the appropriate Inline and Crossline extents for the model. Models can be created in TWT or TVDSS, depending on the domain selected in the output extents. The velocity model will appear in the Volume tab. 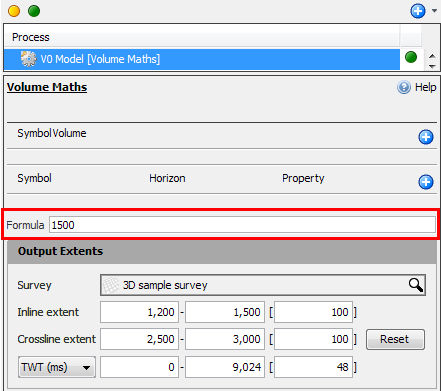 Double click the velocity volume or right-click and select Configure 'Volume'. At Class, select Velocity (Interval) from the drop-down list. In the Details Panel, at Formula, type the formula 1500+1.05*tvdss_m. 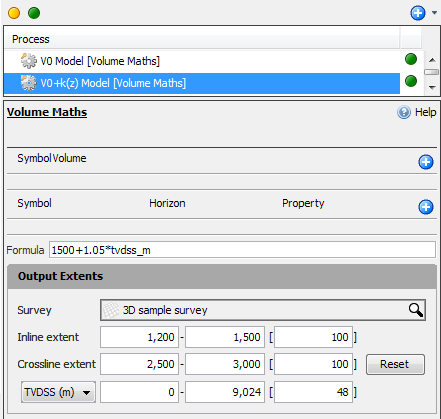 Enter the appropriate Inline and Crossline extents for the model, and select TVDSS as the output domain. In the Volume tab, double click the velocity volume or right-click and select Configure 'Volume'. Change the Class of the volume to Velocity (Interval) from the drop-down list. Create a Window Model using constants or horizons (see Creating a Window Model). Note: If you are creating a velocity model in depth, you must create a window model in depth. 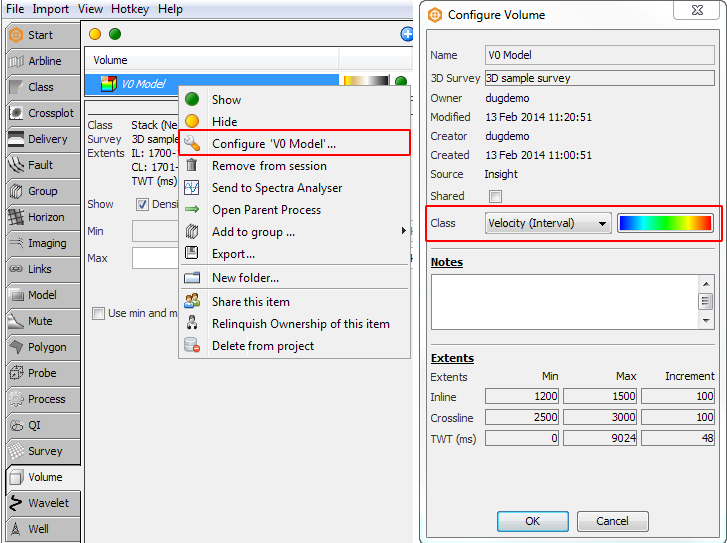 Create a Velocity Model (From Well Checkshots) process and type a Name for the process. Click OK. 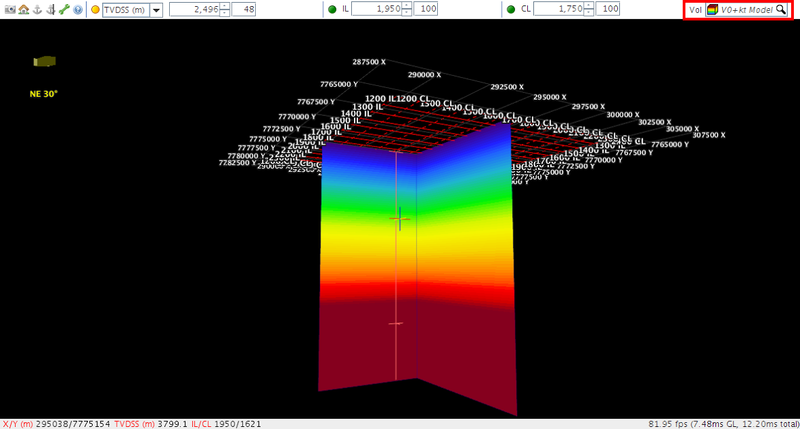 Select the Windowing Model that you have created. Under the Per-Layer Settings section, change the Calculation types to User-specified constant and enter an appropriate value in the adjacent box. Next: How do I create a velocity model from time-depth (T-Z) pairs?